Cappadocia lies in eastern Anatolia, in the center of what is now Turkey. The relief consists of a high plateau over 1000 m in altitude that is pierced by volcanic peaks, with Mount Erciyes (ancient Argaeus) near Kayseri (ancient Caesarea) being the tallest at 3916 m. The boundaries of historical Cappadocia are vague, particularly towards the west. To the south, the Taurus Mountains form the boundary with Cilicia and separate Cappadocia from the Mediterranean Sea. To the west, Cappadocia is bounded by the historical regions of Lycaonia to the southwest, and Galatia to the northwest. The Black Sea coastal ranges separate Cappadocia from Pontus and the Black Sea, while to the east Cappadocia is bounded by the upper Euphrates, before that river bends to the southeast to flow into Mesopotamia, and the Armenian Highland. This results in an area approximately 400 km (250 mi) east–west and 250 km (160 mi) north–south. Due to its inland location and high altitude, Cappadocia has a markedly continental climate, with hot dry summers and cold snowy winters. Rainfall is sparse and the region is largely semi-arid. Cappadocia contains several underground cities (see Kaymaklı Underground City), largely used by early Christians as hiding places before Christianity became an accepted religion. The underground cities have vast defence networks of traps throughout their many levels. These traps are very creative, including such devices as large round stones to block doors and holes in the ceiling through which the defenders may drop spears. These defense systems were mainly used against the Romans. The tunnel system also was made to have thin corridors for the Roman fighting strategy was to move in groups which was not possible to do in the thin corridors making it easy to pick them off. The Cappadocian Fathers of the 4th century were integral to much of early Christian philosophy. It also produced, among other people, another Patriarch of Constantinople, John of Cappadocia, who held office 517—520. For most of the Byzantine era it remained relatively undisturbed by the conflicts in the area with the Sassanid Empire, but was a vital frontier zone later against the Muslim conquests. From the 7th century, Cappadocia was divided between the Anatolic and Armeniac themes. In the 9th–11th centuries, the region comprised the themes of Charsianon and Cappadocia. The area is a popular tourist destination, as it has many areas with unique geological, historic, and cultural features.The region is located southwest of the major city Kayseri, which has airline and railroad (railway) service to Ankara and Istanbul. The most important towns and destinations in Cappadocia are Urgup, Goreme, Ihlara Valley, Selime, Guzelyurt, Uchisar, Avanos, and Zelve. Among the underground cities worth seeing are Derinkuyu, Kaymakli, Gaziemir, and Ozkanak. The best historic mansions and cave houses for tourist stays are in Urgup, Goreme, Guzelyurt, and Uchisar. 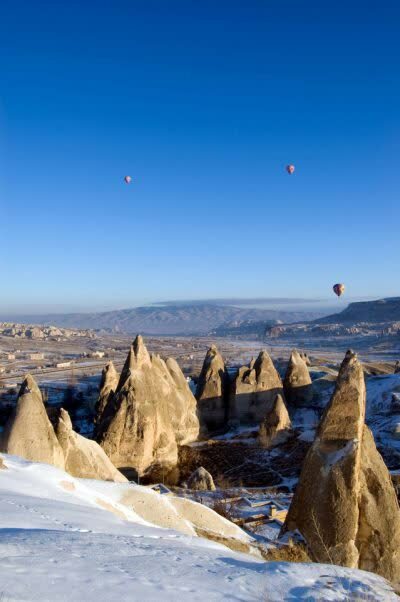 Hot-air ballooning is very popular in Cappadocia and is available in Goreme. Trekking is enjoyed in Ihlara Valley, Monastery Valley (Guzelyurt), Urgup, and Goreme. Sedimentary rocks formed in lakes and streams and ignimbrite deposits that erupted from ancient volcanoes approximately 9 to 3 million years ago, during the late Miocene to Pliocene epochs, underlie the Cappadocia region. The rocks of Cappadocia near Göreme eroded into hundreds of spectacular pillars and minaret-like forms. People of the villages at the heart of the Cappadocia Region carved out houses, churches, and monasteries from the soft rocks of volcanic deposits. Göreme became a monastic center in 300—1200 AD.The first period of settlement in Göreme goes back to the Roman period. The Yusuf Koç, Ortahane, Durmus Kadir, and Bezirhane churches in Göreme, and houses and churches carved into rocks in the Uzundere, Bağıldere, and Zemi Valleys all illustrate history and can be seen today. The Göreme Open Air Museum is the most visited site of the monastic communities in Cappadocia (see Churches of Göreme, Turkey) and is one of the most famous sites in central Turkey. The complex contains more than 30 carved-from-rock churches and chapels, some having superb frescoes inside, dating from the ninth century to the eleventh century. The clubs and bars in Cappadocia aim to provide you with a fun evening of pure relaxation, good conversation and a place to enjoy the end of the day. After sight-seeing around Cappadocia, there is no better place to put your feet up and relax. Modern establishments playing the latest dance music will suit those who still have energy when the sun goes down while unique establishments offer surroundings decorated in the true Turkish-Anatolian style and provide quiet environments for you to compare holiday notes and things to do. Singles, couples of groups of friends are all catered for.